Hey guys! I’ve been elbow-deep in paint the last few days, but I’m taking a break to give you a little progress update. In October I created a little mock-up of what I’m hoping the room will look like when I’m done with it. I’ve changed my mind on a few things since then, but I’m still hoping for the gray walls and all the moulding and boxes. I scooted our couch back to make the room feel bigger, so I no longer have room for a sofa table behind the couch, and I’ve got a new vision for our entertainment center. 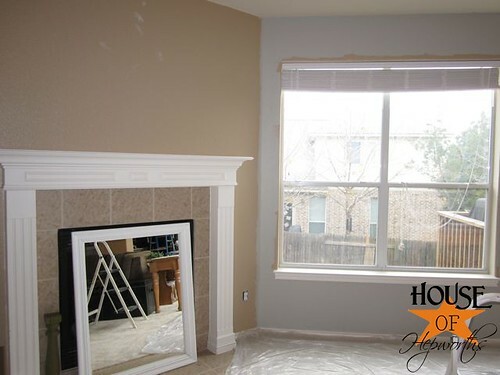 Also, I’ve decided to make the fireplace wall an accent wall and paint it a darker color. 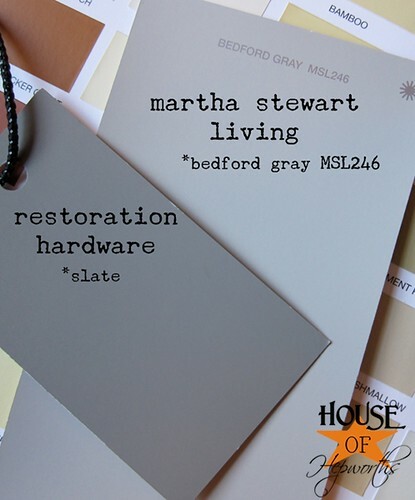 The Slate is the accent color and the Bedford Gray is my main color. So, how is the room looking? I’ve got most of the Bedford Gray finished and am preparing to get the Slate on the walls. You would not believe how MESSY my house gets when I stop cleaning for a few days to work on a project. I swear my kids are walking mini-tornadoes. I left the above adobe walls unfinished because I’m painting them my darker Slate as well. Oh, also, do you see the stairs? Last week I painted some high gloss white (same that I used in my piano room) below the hand rail. Eventually I’m going to add box moulding to that as well. Do you see all those CORDS??!?! Cords drive.me.batty. Seriously, makes me want to rip them all out of the wall and throw them away. BUT, in my husbands defense, I told him it was okay to just throw them all back there because it’s only temporary. 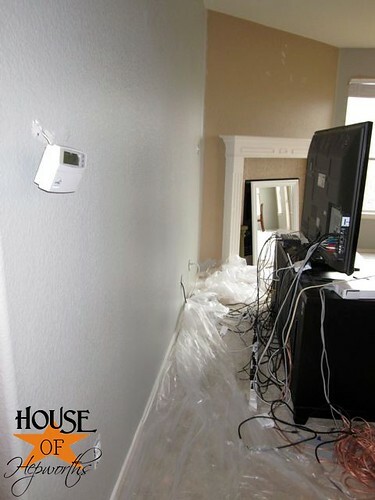 We are going to mount the TV on the wall soon and the cords will be shoved nicely tucked inside the wall. Hopefully we can tackle the TV mounting project soon as well. Overall I’m pleased so far with the Bedford Gray. It went on smooth as butter. I only had to paint ONE COAT of paint on the walls, which was great considering I’m painting the family room, entire kitchen, and the hall by the laundry room. It took me a full day just to cut-out all the edges, but once I was finally done with that tedious task the paint rolled on in less than an hour. I’ve gone back and forth with the color. In some light, it’s the perfect shade of gray. In other light it seems a tad to blue to me. But I think once I get rid of all the tan and adobe on the walls it will stay looking more gray. I think the original wall color still showing is throwing the gray color off a little. Also, I’m not sure if you noticed or not, but I didn’t cut out around the windows. I’m going to add moulding around all the windows, so the moulding is going to cover up the edge. For now the edges are raw and ugly, but hopefully I’ll be able to get the moulding up soon. So there you have it, part one of my family room painting job. Hopefully I’ll be able to finish this soon so my house isn’t swallowed in filth before I have time to clean it again! i am loving the new color! great choice! It’s looking good. Me likey! Can’t wait to see it completely finished. I think it looks GORGEOUS! That is the perfect color – and you should be patting yourself because you did not just paint your family room – you painted half of your freaking house!!!! I love it! Love it! It looks awesome! Yay Martha! That color looks so good with your cabinets. Martha always knows what to do. Fantastic palette. The colors are so pretty! Painting is so much work. My kids are mini tornado’s as well. I really love the colors you picked and I agree the tan color might be throwing the gray off. Looks great! I’m loving the bedford grey! 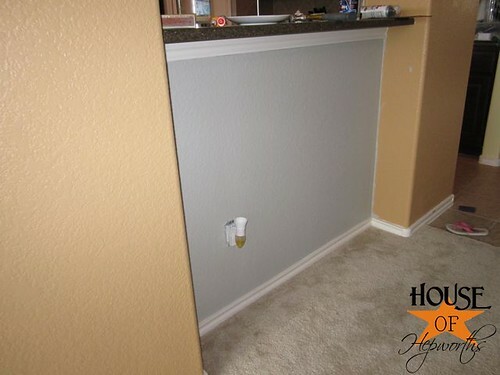 It almost makes me want to repaint the walls in my house. Great choice! Can’t wait to see the other gray. You are a painting machine! And WOW that is a lot of cords! What color are you going to paint your stairway (above the white). Is it still beige? I can’t tell from the picture. It looks great! I am envious because I am ready to paint again. I winder if you guys have thought about mounting the tv above the fireplace… might make a mess right now but how sweet would it be to have all those cords hidden? Also I wonder if your windows are bull-nosed and if so how are you doing the trim work? I LOVE the color – do not change it Allison. It looks great and doesn’t look blue at all in the photos you posted. 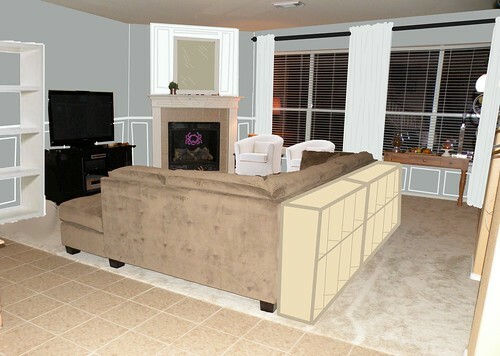 I also love the shelving that you put in your mock-up behind the couch. Can’t wait to see the finished room! 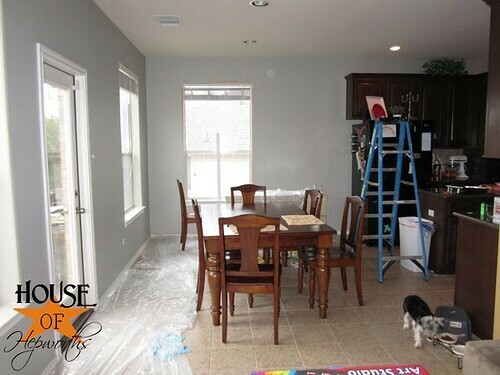 I could never paint or spend a significant amount of time in a room that was gray. I find gray depressing, like gray skies, you know? Of course, at the same time, I love the sunshine and would never consider painting or spending a significant amount of time in a room that was yellow. 🙂 What leads you to select gray? (Apologies if you mentioned this previously. 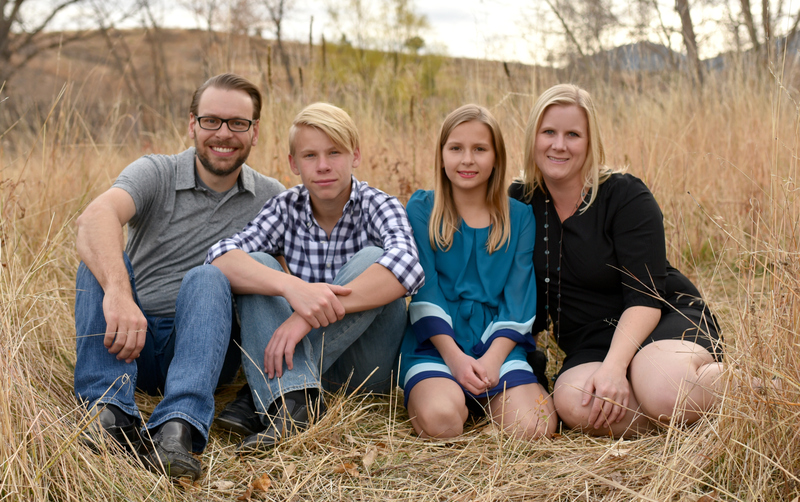 The holidays, our trip to California, and now being struck with “the plague” has made me very behind with blogs!). Cords drive me crazy too! I wish there was an attractive solution for hiding cords when renting. Inexpensive too, of course. The place already looks brighter! What mess? Your room is looking terrific!! Love the color!! 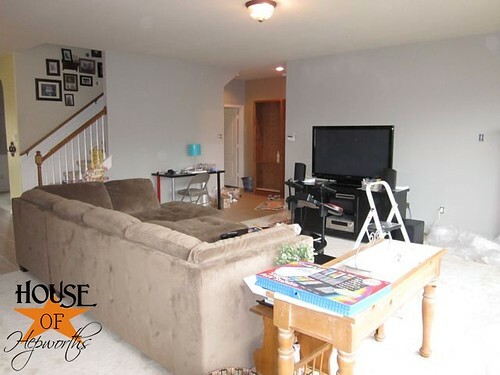 I am going to paint our living room soon…haven’t picked the color yet…and the room has 12 foot ceilings!! Yikes!! Thanks so much for sharing the paint colors!!!! I hate when someone has a really good paint color and doesn’t share the name of it! That gray color is gorgeous! I can’t wait to see it with the darker slate gray, too! I love your grays. It is so hard to pick colors. It took me forever to get one for my bedroom…it’s up and I still can’t decide!! Right now I’m trying to pick fabric for chairs in my living room. I just haven’t found one I really love. Help me pick! My blog is http://www.marthahasminions.blogspot.com. I painted my master bathroom with the Bedford Gray and it does take on kind of an icy blue color at certain times of the day, so I’m sorry to say that it will probably stay that way, but it still looks beautiful. Love that you are using the two colors together, can’t wait to see it all done! Love the gray!!! The room looks sooo nice. I love the change. Can’t wait to see the finished room! Love the paint color! Looks great. Where did you get your sectional.. looks comfy?